Today's post is a bit specific. Specific to those who have ever tried to run a table at a convention. 2. Customer who has been waiting for the doors to open, B-lines it to your table and buys 1 of each of your new stuff. 1-3 in 6 chance they buy an additional copy for their friend who couldn't make it who also loves your stuff. 3. Guy who rifles through every thing on your table, asks tons of questions about each item. Complains about various esoteric things, then walks away without buying anything. In the meantime half a dozen people who were waiting to actually buy something gave up waiting and wandered away. 4. Parent with crying child buys something from your table to pacify said crying child. Child temporarily stops crying. Win, win. 5. Cosplayer asks if you have books/prints/toy of the character they are cosplaying. When you respond in the negative they storm away disgusted. 6. Crowd in front of your table is actually line for the table next to you. 7. Fan of your work comes up, chats with you pleasantly for 1d6 minutes. Buys your newest stuff. Asks politely for signature on items (yes, of course!) and goes on his/her merry way. Posts positive comment on their social media about you. 8. Guy who keeps coming back every hour or so to look at the same book. Last second of the last day of the convention he runs up to your table to finally buy a copy. Asks if you can give him a discount. 9. Clueless person who has no idea what your products are about inexplicably buys your most expensive items. Walks away happy. 10. Apparently homeless guy who hasn't had a bath since ever hovers around your table. Lynyrd Skynyrd's "That Smell" comes to mind. No customers for 2d6 minutes. 11. Popular cosplayer comes near your table. Photographers surround her taking photos. Various people gather round. Blocks visibility of your table, no sales for 2d6 minutes. 12. Customer B-lines to your table, excitedly tells you how much they love your work, eventually realizes they mistook you for someone else. Awkward pause, then they walk away. 1 in 6 chance they buy one of your items out of pity, it will be the cheapest item at your table. 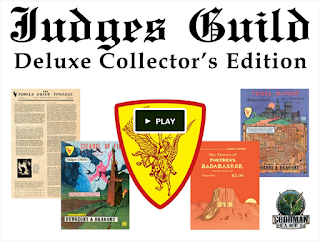 I recently helped Goodman Games to layout a compilation of classic Judges Guild material into a giant deluxe edition. My interest in Judges Guild goes back to the very first experiences I had with Dungeons & Dragons. I went to a local bookstore in Tucson Arizona back in 1982 after I first learned about D&D to get some of the books. In a back corner they had a stack of Judges Guild material, but none of the TSR stuff. I was a bit confused as the only D&D books I'd seen at the time were the Dungeon Master's Guide and the Red Box (Moldvay) set. These books didn't look quite like what I was searching for. Years later I came to understand that they were Judges Guild publications and (to this day) kicked myself for not picking up any of those books! 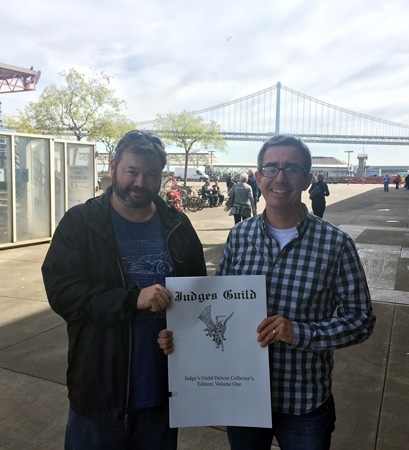 I got some good fortune recently when Goodman Games asked me to do the layout for an EPIC Judges Guild book that compiled the first publications and the classic adventures that Judges Guild did before Adventure Modules even existed! 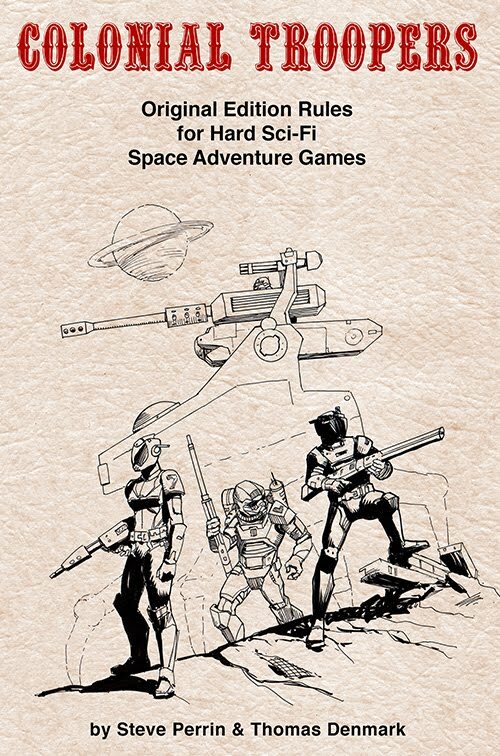 This was like delving into the very earliest days of RPG gaming at the dawn of D&D history. I got access to those earliest publications of Judges Guild in incredibly high fidelity scans. 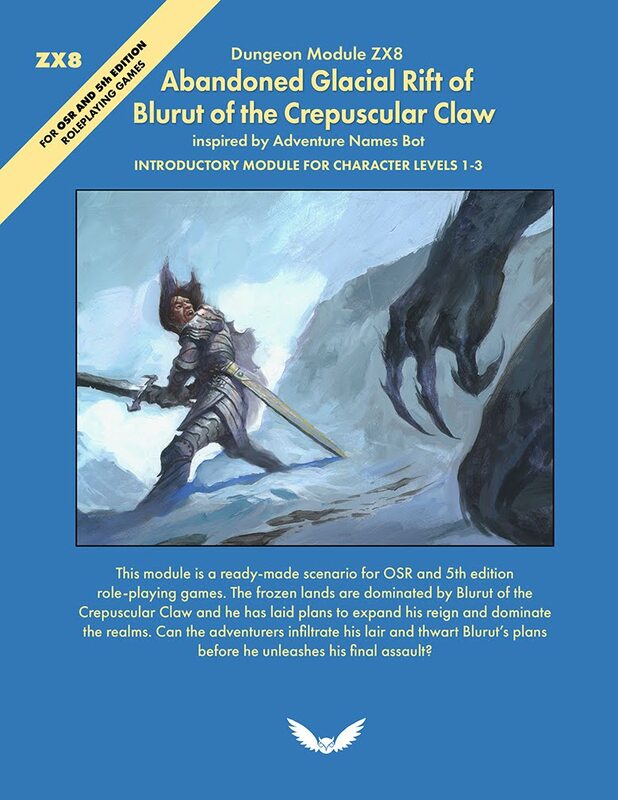 I want to say this book is an old D&D fan's dream. These are the books I missed out on in my youth, and am getting to enjoy and appreciate now. 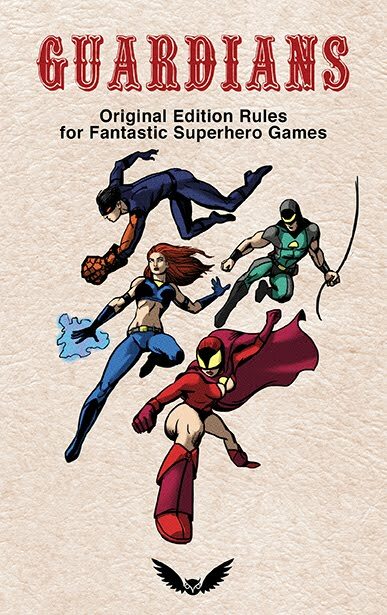 Goodman Games started a Kickstarter to fund the publication of this reprint of classic Judges Guild material. I have the fully laid out book on my hard drive and can't wait to get the print edition. This book is massive and monumental. I hope you are as excited as I am to back the Kickstarter! Some exciting news from DMsGuild today. Wizards of the Coast has added Ravenloft as one of the worlds you can create content for. Ravenloft has long been one of my favorites of the classic D&D worlds ever since that first module came out. I've had some ideas for interesting adventures in that setting for a while, maybe I should consider publishing them now. Anyways, I'm looking forward to seeing what creative things people come up with for this. 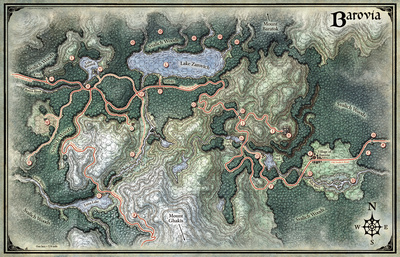 In related news Mike Schley makes fantastic maps, and his Ravenloft maps are some of the best. Go check them out! I'd set a self imposed deadline of today for Beasties to be complete. While it is very nearly done, I'm not sure all the i's will be dotted or t's crossed in time. I like to order books 2 weeks in advance for a convention, and Silicon Valley Comic Con is coming up quickly. I wanted to have Beasties available at my table there. It will be a late night trying to finish this. On the other hand it does look like my Sketchbook 2016 will be done in time, though the special "Gamer Edition" with stats will take a while longer. 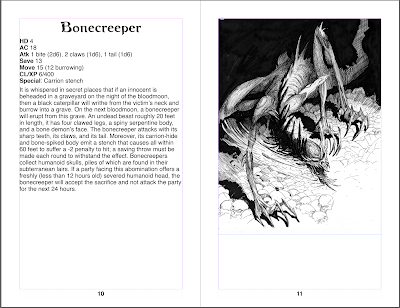 In todays preview is an extraordinarily creepy monster, another one written by Terry Olson, the Bonecreeper is based on a drawing I did sometime back. An early version was posted on this blog back in April of last year. Here is how it will appear in print. 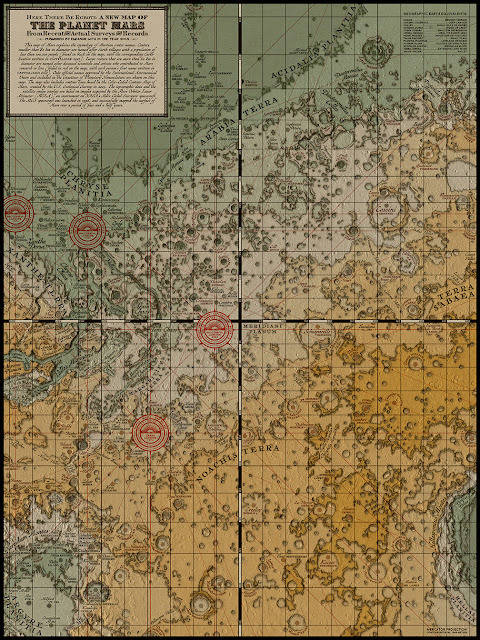 Here is a brilliantly rendered map of Mars by designer Eleanor Lutz using real geological data. The map is done in a medieval style. I could see this being useful in a WotRP campaign. Also, posters are available. 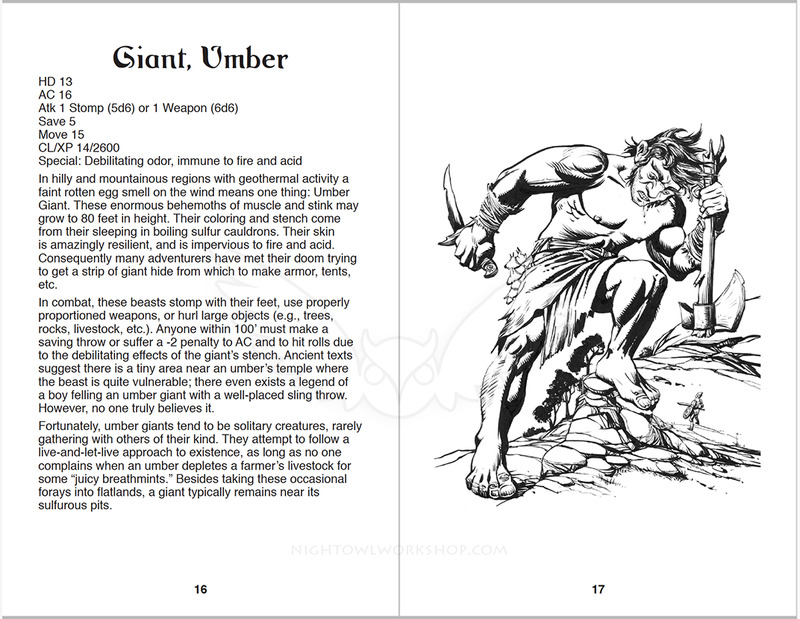 This art for the Umber Giant was inspired by the drawing of a giant in Underworld & Wilderness on pg. 11. Terry Olson wrote up a very interesting monster based on the art I did. 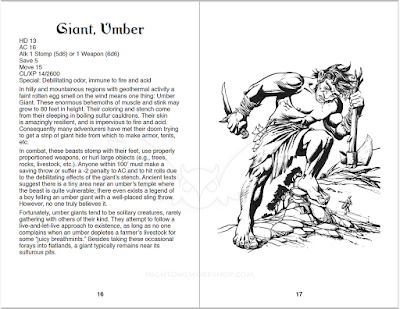 The layout of Beasties is generally following this format with a description on the left page and a full page illustration on the right. The book is coming along well with about 10 monsters of 26, one for each letter of the alphabet, remaining to draw. I'm still working on the write ups and will preview more of them over the next couple weeks.